As you continue to build your collection of tools up, one of the items you will eventually need to have is a roofing nail gun. This kind of tool is not used for only roofs, despite what the name says. There are many different applications and projects where this kind of tool will allow you to be more efficient and effective in completing the task you are working on. You might be wondering, though, what is the Best Roofing Nailer out in the marketplace today? Within this guide, we’ll go over some key aspects of what you should be looking for, as well as offering you reviews of five different roofing nail guns. 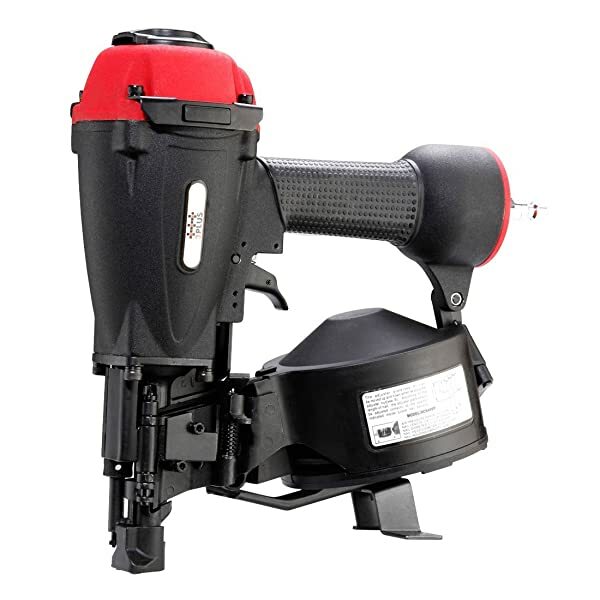 1 What makes a Great Roofing Nailer Gun? What makes a Great Roofing Nailer Gun? When it comes to picking out the right Roofing Nail Gun for you and your needs, there are many factors to take into consideration. Here are a few of those. There are two varying types of nail guns in the marketplace. The first is a Strip-Style gun, where the nails are forged together in a stick or a strip style, and they slide into a predetermined rail. They are typically held together using wire, plastic or paper. This kind of gun tends to be more balanced, as the weight of the nails is evenly distributed throughout the gun. The second type of nail gun is a Coil-Style, where the nails are kept together in one big coil. They are typically held together using wire, and the coil of nails are housed within a round storage space on the gun. They do hold more nails at one time compared to a strip-style, but the weight is all centered in one place on the nail gun. The first kind of power source we’ll review is the battery powered nail gun. This kind of power source is excellent for those places where you need to get into which are a little bit more cumbersome, or if you do not have an electrical outlet nearby. The battery-powered units will be ready a lot faster than other power sources, but they are not as powerful as the other types of power. The second type of power source is the pneumatic power. This is when you have a nail gun hooked up to an air compressor. The pressure this generates is based upon cfm (Cubic feet per Minute) and psi (pounds per square inch). You should ensure you have a tank which can meet the requirements of the gun you have, as they can be purchased separately. This kind of power is almost limitless, but it does take a little bit of time for it to build up the necessary pressure, and you are limited in how far you can travel with it by how long both the power cord and the rubber coil which attaches the gun to the air compressor is. The third type of power is known as fuel-driven. This power source is coming from gas cartridges which are disposable. 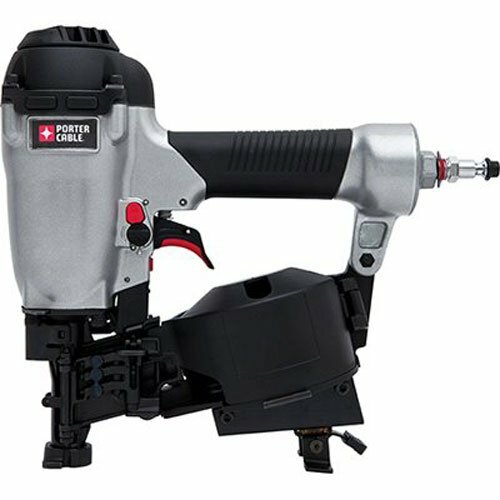 There is an internal battery which helps provide the spark necessary to help the nailer drive the nail into any material you are wanting. The nailer can be as powerful as a pneumatic, and as portable, as a battery charged nail gun. The only drawback is how often you have to buy new gas cartridges. There are four different ways you can fire the nail gun to get the result you are wanting. The first way is using a single-sequential method, which will prevent you from firing nails out by accident. You have to push down the safety tip and then pull the trigger, in order to utilize the gun at first. If you are working on one surface, you can move the gun while keeping the safety tip down and can fire as many times as you want. The second method is the single actuation. This is very similar to the single-sequential; however, you do not have to go in any specific order to get a nail out. The third kind of firing is the contact method. This method allows you to fire as many nails as you want at once. If you are holding down the trigger button, as soon as you bump the tip of the gun against a surface, it will fire into it. The fourth type of delivery is full-sequential. You cannot utilize the bump-fire method with this kind of delivery, as you must bump against a surface, and then pull the trigger. This is the kind of delivery system needed for those with a high amount of safety needs. Putting a roof on a building is an important task. No one wants to be surprised by unexpected leaks, so the roof needs to be nailed down perfectly. These 10 roofing nailers get the job done, but they all do it with slightly different features. It also has a shingle guide that lets you space the shingles quickly so you can maximize your time. It also features skid-resistant pads so it won’t slide down the roof when you’re not using the nailer or out from under you while you’re working on a slanted roof. The nailer is easy to clean with the removable carbide-tipped nose assembly piece. Each feature is designed with safety in mind. Even the exhaust port can be swiveled away from your face with the 360° adjustability feature. It also has a non-slip rubber grip to keep the nailer in your hands. The nailer uses a PSI between 70 and 120 and can accommodate nails that measure ¾-inch to 1 ¾-inch. They can be quickly loaded with the side-loading magazine feature. The 11-gauge nailer weighs under six pounds, making it one of the lightest on the market. Because of its size, the nailer does not have a rapid-fire feature. It can be used with staples or nails and can be used on other surfaces, including floors. It is made mostly of plastic pieces, making it a good choice for occasional use rather than for professionals. You can use nails or staples from different manufacturers. The Superroofer lives up to its name as it gets the job done about as perfectly as a nailer will do with no jamming at all. It has a tangle-free swivel joint and a depth control dial. It is easy to maintain with a filter on the end cap. This lightweight, professional-grade nailer uses metric measurements but weighs in at 5.5 pounds. It holds nails up to 1 ¾-inch so it is perfect for jobs like attaching shingles, installing siding, and building small wooden items. The nose magnet keeps the last nail in place. It’s not the cheapest model of the bunch, but it is one of the best options for the price. It does not come with a carrying case or any other items. The Bostitch RN46-1 is a moderately priced, powerful air nailer that delivers accurate placement for professionals and occasional handymen. With the powerful 410 in./lbs of force, the nailer can drive in nearly 100 nails per minute, making it incredibly efficient for roofs and other large spaces. It works with a bouncing motion for accuracy and power. The Bostitch nailer is loaded with safety features, too. It includes a zero-nail lockout so dry firing doesn’t happen. It is made of durable aluminum and weighs in under six pounds. It also has a carbide nosepiece, wear guards, and skid pads for safe use on rough surfaces. The comfortable grip lets you use the nailer in any weather conditions. The quick-loaded magazine can hold up to 120 nails that measure between ¾-inch to 1 ¾-inch with a shank up to 0.120 so you do not have constantly fill it, thus reducing downtime. 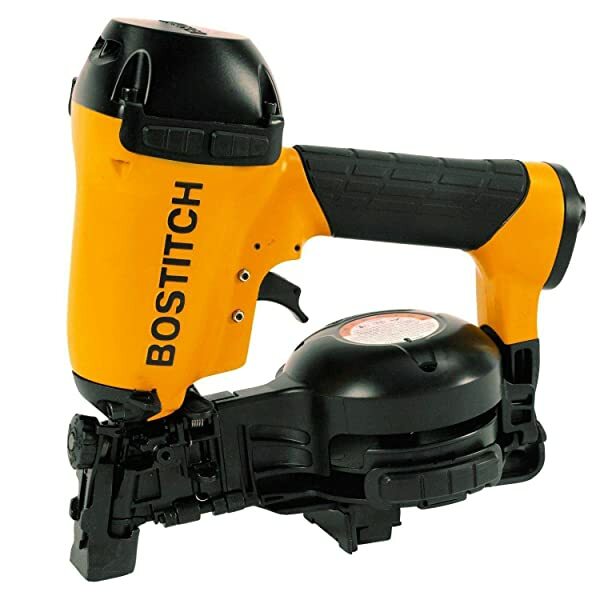 The nailer also comes with a seven-year warranty from Bostitch. It is a loud machine and does have some kickback, but it is easy to get to used to it. It is easy to maintain, especially with regularly oiling before each use. There are attachments that make the nailer even more useful. The Hitachi HV45AB2 is built for the professional and handyman, alike. It is an incredibly durable machine that will let you install roofing shingles, insulation boards, and more. The side-load magazine is easy to use and holds a magazine of 120 nails at .120 diameters so you can get the job done quickly. This pneumatic nail-feed mechanism keeps the machine working in all weather conditions. 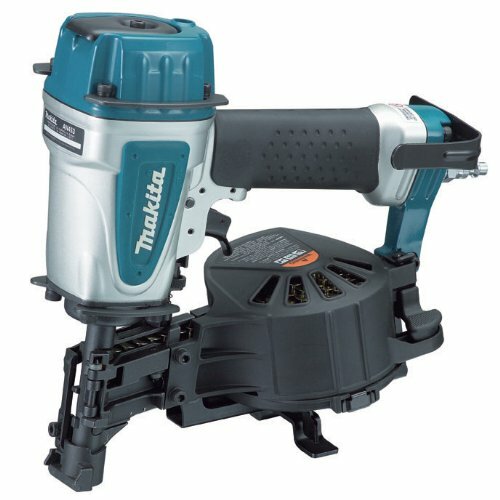 The mechanism removes debris from the nailer, so you don’t have to do it yourself. It is also relatively quiet and barely kicks back when firing. The side-loading magazine holds nails that are ⅞-inch to 1 ¾-inch nail in a coiled configuration. The PSI ranges between 70 to 120 PSI. The machine uses a quick-drive mechanism that is easy to maneuver and the since it only weighs 5.5 pounds it’s incredibly safe to use with one hand, too. The non-slip rubber grip and the rubber pad on the side prevent it from falling off of slanted rooftops. It also comes with a five-year limited warranty. 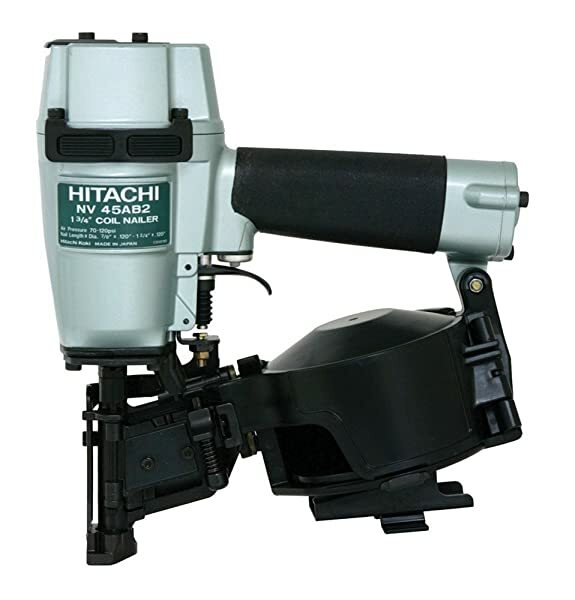 Unlike lower-priced options, the Hitachi nailer never misfires or misses a shot. It can be easily maintained with pneumatic oil. It does require a small tool to adjust the spacing for shingle work. 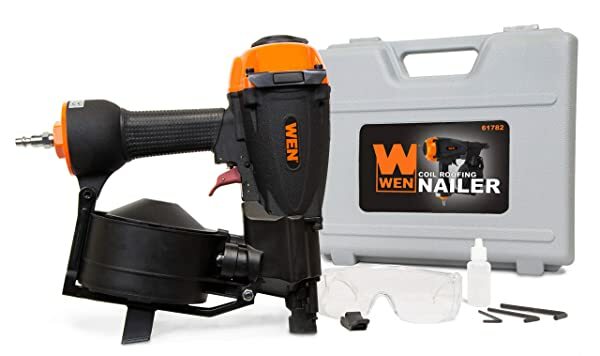 Like the other nailers on this list, the WEN holds a magazine of 120 nails that range in size between ¾-inch and 1 ¾-inch in size. There is a depth-setting wheel on the head of the nailer. You can also use the shingle guide to space nails when working on a roof. The WEN is powerful, firing nails at 430-inch-pounds at ranges between 70 and 100 PSI. The nailer has a case made of lightweight magnesium. But, because it is so lightweight, it does occasionally double fire. This affordably priced nailer comes with oil, three hex wrenches, and a carrying case. It also has a one-year warranty. 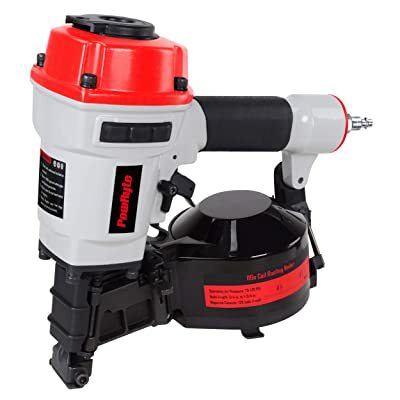 This affordable nailer may not be the first name you recognize, but it is a good choice for occasional roofing work or other handyman activities. This nailer also works with nails that measure between ¾-inch and 1 ¾-inch. It fits a coil of 120 nails in its high-capacity magazine. The 3Plus features skid pads on both sides so the nailer will not slide off of the roof. And, it has an adjustable shingle guide so you can easily space nails while working on the roof. For more safety while on the job, it also comes with a 360° tool-free exhaust to keep debris out of your way. You can also adjust the depth of the drive so the nails fit perfectly, each time. The nailer is easy to maintain with the removable nose piece. It’s slightly heavier than the other nailers on this list, but only by a pound. It does need to be oiled prior to its first use, otherwise, you might run the risk of it jamming. It runs best at 90 PSI. Dewalt is one of the most recognizable names in power tools and for a good reason – the brand works. The pneumatic roofing nailer is a good choice at a professional-grade price. It is lightweight at 4.5 pounds and is made of a mix of metal with a plastic coil cover for durability and easy maintenance. The nailer uses a high-speed valve technology that drives 10 nails per second -which is one of the speediest on this list. It has a wheel that allows for quick depth adjustment and you can use the numbered levels to get the nails just where you want them. The machinery has high-quality engine seals to keep the nails driving in at top speeds. For safety purposes, it has steel skid plates that have rubber inserts so you do not have worry about it sliding off of roofs. It functions at PSI rates between 70 and 120. Unfortunately, the exhaust does not spin but is fixed at one point. It does not come with a case or any other accessories. Dewalt provides a seven-year warranty. This nailer is one of the lightest on the market and is moderately priced for professionals and amateurs. It has been upgraded from its previous model making it easy to use and control. It works with nails that measure between ¾-inch and 1 ¾-inch wire roofing nails. But, it is also designed to work with other projects, like siding or indoor work, too. It holds a magazine of 120 nails. You can choose to use the single-sequential or contact mode to fit the need of your job. It is designed to avoid jams and to be easy to load. It is a comfortable tool to use due to its ergonomic grip. The motor has an exhaust diffuser so you do not have to worry about debris in your face. It is built to last out of durable steel and carbide. It also has a shingle guide that locks in place so you can have consistency on your roof. The nail magazine has two doors for easy and safe loading, too. The tool comes with a three-year warranty and one year of free service from Porter-Cable. The tool does not come with accessories. It does work well with regular oiling. It is a rugged and durable machine that weighs 5.2 pounds. It holds 120 nails that measure between ¾-inch and 1 ¾-inch in the magazine. You can set the depth without using any tools and the nailer will drive them flush. Even though it has a PSI range between 65 and 120, it functions best at 90 PSI. The nosepiece has carbide inserts to keep the nailer working for a long time. It has an adjustable canister that is easy to load and you will know the last nail is driven due to the built-in magnet. To keep the nailer working for a long time, it has large steel plates on the sides and the nosepiece does come off for easy cleaning. For safety purposes, it has a hook that you can attach to a belt. It also includes a shingle guide for perfect spacing on the roof. It rarely misfires. Since Makita inspects and tests products before shipping them, you can trust that the nailer will do its job for a long time. And, it comes with a three-year limited warranty. The Senco nailer is ideal for projects both on and off the roof. It is designed for shingle nailing as well as adding other roof features like tar paper, insulation board, and metal drip edges. It is also a good choice for siding projects, too. 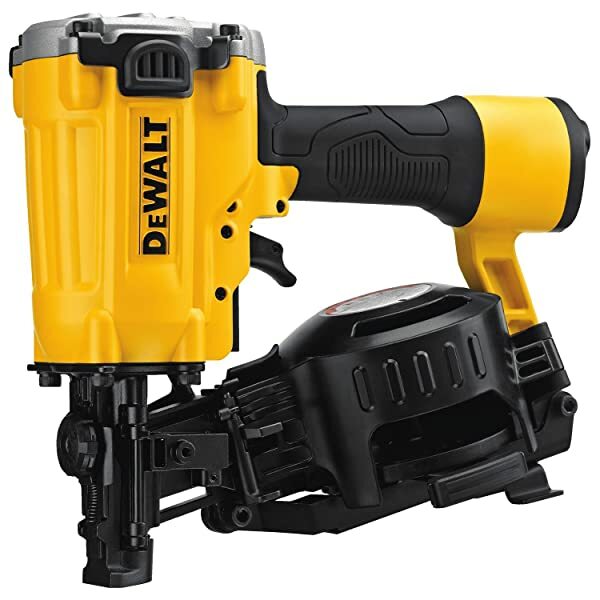 The nailer has an aluminum housing which makes it lightweight at 5.4 pounds. Aluminum is durable and the best choice for roofing projects. The depth of drive can be adjusted without tools and it sets nails at the depth selected. For convenience, the nail canister will hold round-head roofing nails of all sizes. For comfort and safety, the nailer has a molded grip and an adjustable shingle guide. The exhaust can be adjusted 360° to direct debris where you want it. The steel wear plate keeps rough shingles from damaging the exterior of the nailer. It does work better with regular oiling. 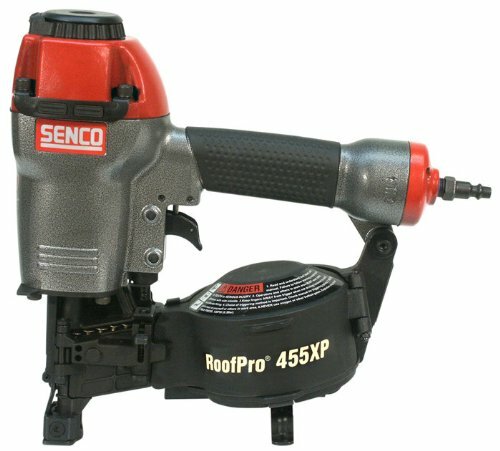 Professional roofers appreciate the quality and price of the Senco brand of nailers. One of the fastest ways to put on a new roof is thru the use of a Roofing Nailgun. This gun will ensure the nails go in very easily, quickly and efficiently and overall ensure that you are safer than when you use a typical hammer and nails. However, even with this being the case, you always have to be aware there are some inherent dangers with roofing nail guns. Within this guide, we’re going to review some of the roofing nail gun safety tips you should adhere to while utilizing this tool. There are four different methods of firing mechanism’s when it comes to your roofing nail gun. Each type of mechanism will allow you to fire nails in a certain manner, while also keeping you either more protected or put you more in danger. The most dangerous method of a trigger is the contact method. This method will allow you to shoot out numerous nails at once, once the bumper has been activated. Although this makes it very efficient, it can also mean that you can shoot out nails even when you are not intending to. This can lead to injuries to your hands, feet, or other body parts. The next dangerous method is the single actuation. This method will allow you to fire a nail out of the gun when you pull the trigger and when you bump the safety tip on the gun. These two actions can be done in any order, which means if you bump the safety tip by accident, and then pull the trigger, the gun can fire when you don’t intend to. The second safest method is the single-sequential method. This method means that you have to do things in a certain order in order for the gun to operate correctly. This ensures you know the exact method in which to fire the gun, so you can get the nail out properly. The safest method when it comes to finding the right trigger for your nail gun is the full-sequential. This method will not fire unless the safety tip is bumped up against a surface which can accept nails. This method is the safest method in order to use your roofing nail gun. No matter which trigger system you choose, you need to ensure that everyone who will be operating any nail gun is fully trained on the trigger system, so they do not fire nails out by mistake. The knowledge of the trigger type is vital towards operating any nail gun safely and securely. Even if someone has used a roofing nail gun before, it is important that they review everything with a new nail gun to ensure they know how to use it properly. Every type of nail gun will have its own quirks and will feel differently within each hand. Plus, the trigger button will fire differently with each type of gun, so it needs to be tested out before being used. When it comes to training, there are certain aspects which should be covered with everyone, every time. How does this Nail Gun work? How do I inspect the Nail Gun? What risk is associated with this Nail Gun? What kind of injuries should you be aware of with this Nail Gun? How do you properly load nails into this Nail Gun? What kind of power source does this Nail Gun utilize? How should I carry the Nail Gun to ensure it does not fire by accident? Other topics which can be covered include knowing how to recognize surfaces which could cause your nail gun to ricochet. Additionally, what is the proper form for when you fire a nail gun, and if you are off base, what will that mean for when you fire the nail gun? Not only is training necessary, but it is very important to set up proper procedures for everyone who uses a roofing nail gun, so they understand how to use the nail gun without harming themselves. These procedures should include having the following available. Roofing Nail gun manual, so it can be reviewed before each use. All aspects of the nail gun need to be looked over and analyzed before each use. If there is a dent, gouge or a malfunction with the nail gun, it needs to be taken out of service immediately. This includes checking over the power source, to ensure it will not give out on you during use. You need to state how far away your hand should be from the area where you are nailing. The standard practice is 12 inches, but whatever is decided, it needs to be stated and adhered to. You should always fire the nail gun away from your body, to ensure there is no chance of injury. If you are using an electrical nail gun, you need to unplug the nail gun from the electrical cord when it is not in use. If you are using a pneumatic nail gun, then you need to disconnect the nail gun from the rubber hose so you will ensure the nail gun will not fire on you by accident. You should never carry the nail gun by holding it by the trigger button. The nail gun should never be taken apart, especially out in the field. If a gun misfires or breaks while in operation, then it needs to not be used. Always have a hammer and some nails with you, so you can hand nail certain areas where it is not wise to use a roofing nail gun. When it comes to finding the right roofing nail gun for you and your needs, there are many different options within the marketplace. Depending upon how many different nails you might fire in a day, and how often you will be firing the nails, should determine what kind of roofing nail gun you should go with. As you can see from the reviews, there are a lot of variations even among nail guns which might at first glance seem more similar than they really are. We wish you good luck in finding the right one for you to tackle all the different projects you have with your own house, or with where you work.